Beneath the water’s surface, in a stream or river near you, a tiny native fish is searching for a rock. It has to be the right size and shape, in the right location in the stream and the right orientation to the current. It also has to be defended from all the other little fish currently on the hunt for the perfect rock! The magnificent bluegill bully. Photo: Alton Perrie. The bluegill bully (Gobiomorphus hubbsi), one of New Zealand’s lesser known native fish is preparing for autumn spawning. Bluegill bullies are a stocky, tubular fish, sandy to dark brown/black in colour with blotchy markings and distinctive dark spots on their cheeks. They get their name from the brilliant, iridescent blue band that is visible on their gills. Bluegill bullies are the smallest of New Zealand’s seven bully species, with most adults growing only to around 50-60 mm in length. 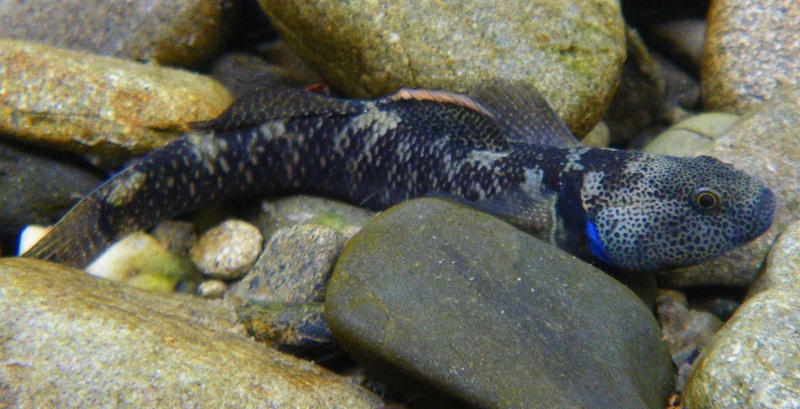 Bluegill bullies are found throughout New Zealand, mostly in rivers closer to the coast, although in some locations they have been found in streams far inland. They inhabit swiftly flowing, often turbulent areas of streams and rivers that usually cobbly, gravelly, unstable bottoms. Bluegill bullies feed on small aquatic insects and have a crepuscular rhythym —so they are most active at dawn and dusk. Not much is known about bluegill bully reproduction, but they are thought to spawn twice a year, in spring and autumn. Males locate a spawning rock and defend it against all intruders except for receptive females who wish to lay eggs. The male fertilises the eggs, then watches over them until they hatch. The tiny bully larvae are washed out to sea, where they spend around six months before re-entering freshwater and gradually moving upstream to begin the cycle all over again. These flashy little fish are found nowhere else in the world, and, like most New Zealand freshwater fish, could use a helping hand (they are listed as “At Risk” by the Department of Conservation). Bluegill bullies like clean, well-oxygenated water, so you can help this species by discouraging practices like pollution, over-irrigation and river-straightening, which remove the kind of habitats that bluegill bullies need. Amber; may I use your photo of the bluefin bully eggs in an educational sign for one of our city open spaces? We are trying to educate the public about habitats! 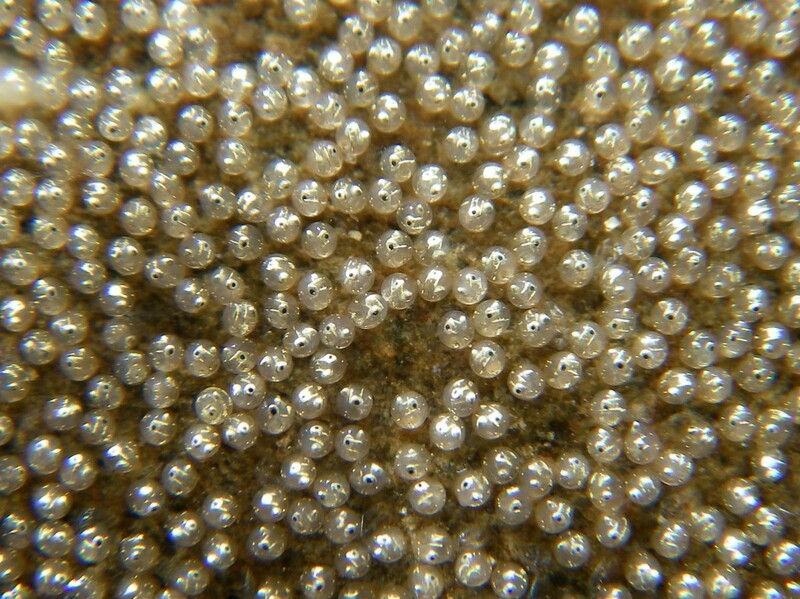 We do not have this species, but need a photo of fish eggs that are the right color. Thank you. I am not able to pay (government agency), but would be very grateful to have a photo rather than creating a drawing! Thank you!